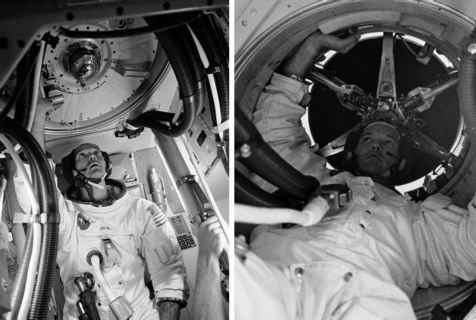 After the loss of power on board Apollo 13, its crew found themselves in the uncomfortable situation of discovering what happens to the cabin temperature of a spacecraft after a power cut. With no electricity running through the systems of the CSM and very little in the LM, hardly any heat was being generated - heat that the crew depended on for warmth and comfort. Despite the unfiltered rays of the Sun falling on the ship, a chill permeated the cabin until an equilibrium temperature of only 6°C was reached. In a properly functioning Apollo spacecraft, the substantial amount of electronic gear that it contained generated copious quantities of heat and, for the designer, the problem was to keep the spacecraft cool. Heaters were only required for items of peripheral equipment that felt the chill of space. To control internal temperatures, the CSM had a sophisticated cooling system that took heat from where it was not wanted, sent some of it to where it was wanted, and rejected the rest into space. The electronic boxes in the command module were mounted on metal plates, known as cold plates. These were cooled by pipes containing a mixture of water and glycol - the same mixture used in the radiators of cars to cool the engine block. By the time it had passed through all the cold plates, the coolant was quite warm and, if required, could be used to heat the cabin air, which again is something similar to the system in a typical automobile (at least one without air conditioning). The warm liquid was then pumped to the service module where it was passed to one of two large radiators built into the spacecraft's skin. At any given time, one of these radiators would be basking in the full heat of the Sun while the other was being chilled by the cold of deep space. As automatic controls fed the coolant to whichever radiator was colder, the heat from the command module was released through radiation. For the sake of redundancy, the spacecraft had two independent parallel radiator circuits in case one developed a leak or became blocked. Automatic systems monitored the outlet temperature of these radiators to keep them from freezing. The cold water/glycol mixture was then returned to the command module where it could absorb more heat from the spacecraft's electronics. These radiator panels were not designed to lose all of the command module's heat but they provided a simple, passive method of dealing with most of it. A second, much more active system was built into the command module to take care of peaks in the spacecraft's heat output - for example, during preparation for a burn when most of the spacecraft's systems were powered. This was the evaporator, often referred to by the crew as a 'boiler', which worked because energy is required to convert a liquid to a gas. When water evaporates, it takes heat from its surroundings, which is why we sweat when we are too warm. The evaporator uses the same principle, but by introducing the water to the vacuum of space, the evaporation is much more vigorous, making it a very efficient cooling system. In the spacecraft's evaporator, spare water generated by the fuel cells was fed through metal plates that contained many tiny holes. Beyond the plates, the water encountered a mass of porous stainless steel called a wick, the other side of which was exposed to space. The evaporation of water from the wick kept it cold. Pipes from the coolant system were passed through this assembly and the water/glycol within them gave up its heat to the vaporisation process. The water vapour from the evaporator was led to space through a duct, called the steam duct, which exited from a port just below the crew's left-most window. A valve in the duct controlled the loss of vapour to ensure that the wick remained wet and did not freeze. A frozen evaporator was considered a danger because there was a possibility that the expanding ice could breach the spacecraft's pressure hull. Redundancy dictated that there should be two evaporators, one each for the primary and secondary cooling systems.